The prosecution on Wednesday indicted aides of former President Park Geun-hye on charges of perjury and falsifying documents in changes made to the time log of developments on the day of Sewol sinking in 2014. The former presidential aides indicted in connection with the case are former chief of staff Kim Ki-choon, and Kim Jang-soo and Kim Kwan-jin, who headed the National Security Office under Park. The suspects are accused of document falsification and damaging public documents. Former presidential secretary Yoon Jeon-choo was also indicted for perjury. 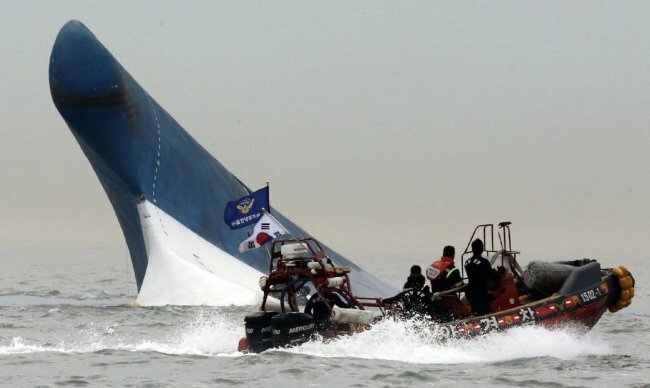 Following the 2014 deadly sinking of the Sewol ferry in waters off the southwestern island of Jindo, the Park administration fabricated the time Park was first briefed on the accident, according to prosecutors who looked into Park’s alleged negligence of duty that may have led to lax rescue actions. The Seoul Central District Prosecutors‘ Office announced the probe result Wednesday, saying the presidential office deliberately altered the time when the ex-president received the first report on the sinking from around 10:20 a.m. to around 10:00 a.m., during which the ferry had already begun sinking before 9 a.m. and completely went under water at 10:30, claiming a total of 304 lives. Prosecutors found the National Security Office could not reach Park in time after they learned of the accident through the Coast Guard, delaying the administration’s official instruction for a rescue effort. Park gave the first instruction about the rescue at 10:22 a.m., prosecutors said, not 10:15 a.m. insisted by the previous administration. It was also revealed by the probe that then National Security Office head Kim Kwan-jin deleted parts of the national crisis management guidelines without due legal process that specified the agency’s role as a “control tower” during national crisis situations, in an apparent attempt to avoid responsibility for the rescue failure. The result shows, however, that no evidence suggests Park was involved in the time log fabrication. The alleged mishandling of the Sewol sinking triggered massive street protests in late 2016, calling for Park’s impeachment who faced wide-ranging corruption allegations. Park was ousted from office in March last year and is now on trial in custody for almost a year for multiple charges including bribery, coercion and abuse of power. Her verdict is due on April 6.